Eat, play and win at the Le Quest Family Fun Day! On 3 and 4 November 2018, Saturday and Sunday, watch the Le Quest Sales Gallery expand to offer an array of activities and treats for the whole family. Let your kids play in the bouncy castle and unleash their creativity with decorating delicious cupcakes. Pick a favourite airbrush tattoo and bring home helium balloons. Hungry? A slew of snack stations serving popcorn, candyfloss, ice cream, churros, hotdogs and more will satisfy stomachs. Don’t miss out on a sure-win lucky dip to sweeten the visit. Visitors can stand a chance to walk away with an assortment of service and food vouchers, souvenirs or the grand prize—a Fotile Cooker Hood worth $1,099! 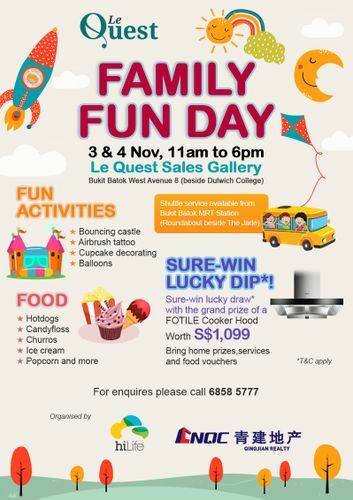 Enjoy a fun-filled weekend with your family at the Le Quest Family Fun Day!